Each week my four year old gets to choose a book to borrow from the school library. This week he chose the book Mad Machines and Dotty Devices - Mind Boggling Inventions! It's a cool book of science / craft projects to make. He decided that he wanted to make the robot that's in the book. 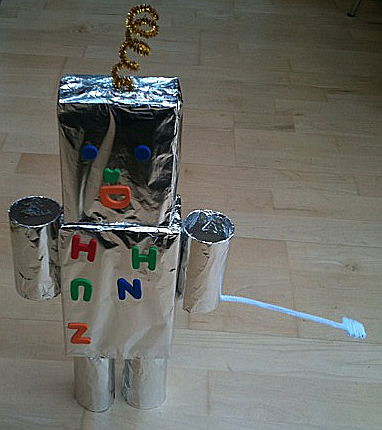 So this week we saved boxes and cardboard tubes until we had time to make the robot on Sunday. We got out the kitchen foil, scissors and sticky tape and got to work. He had lots of fun decorating with sticky foam shapes and letters. I thought we were about done. Then he said, now we need the cable to connect it to the computer. Very cute, I thought and fashioned a USB cable look alike from a white pipecleaner (chenille stem.) "Like this?" I said. "It needs to be a real cable so we can actually control it from the computer" he replied determinedly. Aah. The penny dropped. He wanted to make it into a real robot! His brother has a robotic arm with a USB cable and he was expecting to be able to do the same. OK. Robotics here we come.